Coming off the Redruth-Chasewater Trail the route takes you into the village itself before going off to the nearby hill Carn Marth. The village offers local facilities to shop for some food or to stop and have a drink and a bite to eat the Carharrack Stars pub. During your stop you can enjoy the rich history of the village by visiting these features all within a short distance of each other – the Shute, Ting Tang railway tracks, the iron footbridge and the old Coal Yards. 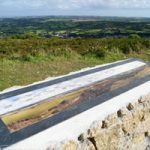 The route out of the village will take you gradually up hill until you get to the top of Carn Marth where you will get a fabulous view of the surrounding villages and countryside on a clear day both north and south coasts. 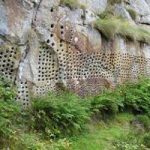 Holes drilled into the granite rock by high pressure steam boring equipment. Originally designed by Richard Trevithick. The drills made the job of extracting the stone a lot easier and through various alterations over time were used throughout the world. 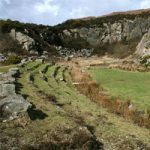 After the purchase of the land on Carn Marth by the Trust the lower quarry was converted into an open air theatre. Despite a power failure half way through the first production by Cornwall Theatre Company ‘The Three Musketeers’, the performance was judged a tremendous success and has since gone on to show many plays. Considered a Holy Well / Spring in Cornwall. Also known as Maggy Figgy and Margery Daw well it was a popular place to christen your doll on Good Friday.